Blanched almonds are ground into fine powder. 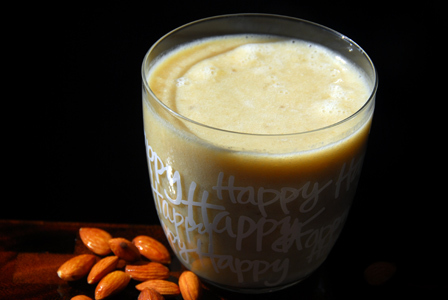 Banana is chopped and blended with milk and almonds into smooth mixture. Serve banana almond milkshake immediately. Makes: 2 Servings of Banana Almond Milkshake. Peel and roughly chop the banana. Grind almonds into powder using the grinder. Then add the chopped banana and little milk and blend again. Once smooth, add remaining milk and blend well. Pour into glasses and serve banana almond milkshake immediately. Notes: Make sure to blend the banana well. Suggestions: Add crushed ice while blending if desired. Variations: You can also add honey as a sweetener. Other Names: Banana Almond Milkshake. 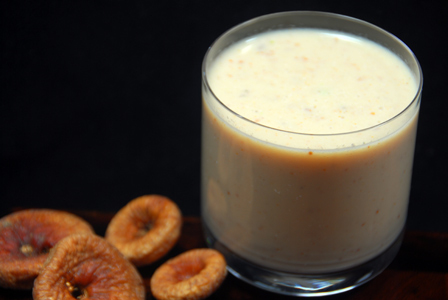 Plain milk is blended with freshly ground nuts and dried figs. Dry fruit milk can be served warm or cold. Makes: 1 Serving of Dry Fruit Milk. Soak fig in hot milk for around 5- 10 minutes for it to soften. Grind pistachios, cashews and almonds into powder using a blender. Then add the soaked figs and milk and blend well. Pour into a serving glass and serve cold. Notes: Make sure to blend the fig well. Suggestions: Microwave the fig soaked in milk for around 20 seconds to soften further before grinding. Variations: You can also add seedless raisins to make the milk much sweeter. Use crushed ice or ice cubes while blending milk if desired. Other Names: Dry Fruit Milk. Plain thick yogurt is whisked with spice powders into thin buttermilk. 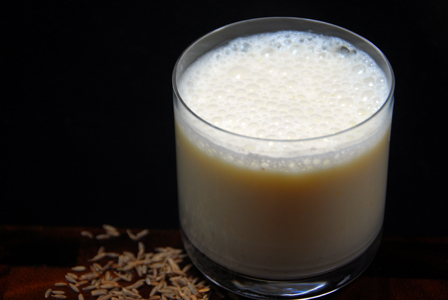 Serve cumin buttermilk after a meal or before going to bed. Makes: 1 Serving of Cumin Buttermilk. Whisk yogurt with a cup and half of water. Stir in cumin seeds powder, turmeric powder and salt. Notes: Make sure to whisk the yogurt well. Suggestions: For best taste, toast the cumin seeds till they turn light golden and grind them into fine powder. Make sure the consistency of the buttermilk is on the thinner side. Variations: You can also check other buttermilk recipes here. Other Names: Cumin Buttermilk, Jeera Majjiga. Ginger and cardamom are crushed and boiled in water for a minute or more. Then the liquid is flavored with turmeric powder, lemon juice and honey. Serve hot healthy beverage immediately.Makes: 1 Serving of Hot Healthy Beverage. Peel, wash and thoroughly crush the ginger with help of a pestle. Lightly crush the cardamom and keep aside. Bring to boil a big cup of water, add ginger and cardamom. Boil for a minute and strain the liquid. Stir in turmeric powder, lemon juice and sufficient honey. 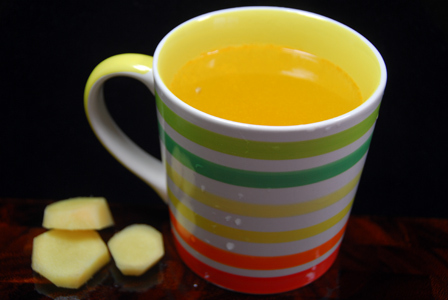 Mix well and serve hot healthy beverage immediately. Notes: Make sure to boil for at least a minute before removing from heat. Suggestions: You can also microwave for around 2 minutes. Variations: Add a green tea bag if desired once the liquid is strained. Other Names: Hot Healthy Beverage. 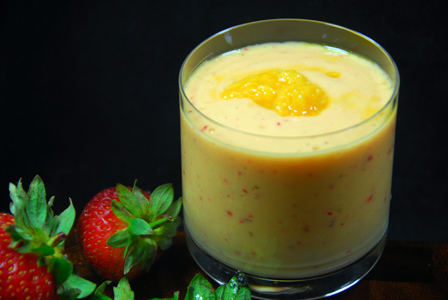 Strawberries are blended with fresh ripe mango and plain yogurt into a smoothie. Honey or sugar can be used as a sweetener. Serve mango strawberry smoothie immediately . Makes: 2 Servings of Mango Strawberry Smoothie. Wash strawberries under water and chop off the leaves. Wash the mango and squeeze the juice. Alternatively, discard the skin and chop the pulp into small chunks. Blend together strawberries, mango, thick yogurt and honey (if using) into smooth mixture. Add the ice cubes (if using) and pulse couple of times. Pour the mango strawberry smoothie onto serving glasses and garnish with mango pulp and serve immediately. Notes: Make sure not to blend too much once the ice cubes are added. Suggestions: Add sugar syrup or sugar in place of honey if desired. Variations: Add greek yogurt in place of plain thick yogurt if you wish. Other Names: Mango Strawberry Smoothie.